The 500X is the retro-styled 500 family's only model that offers 4wd. The 500X has the widest engine and transmission range within Fiat’s lineup because it will be sold in more countries than any other Fiat. The crossover will be available in 100 global markets by year-end, including the U.S. where Fiat expects it to outsell the retro-styled 500 three-door hatchback. Buyers of the 500X have a choice of seven gasoline engines, three diesels, four transmissions and the option of a front-wheel- or four-wheel-drive configuration, depending on the market. 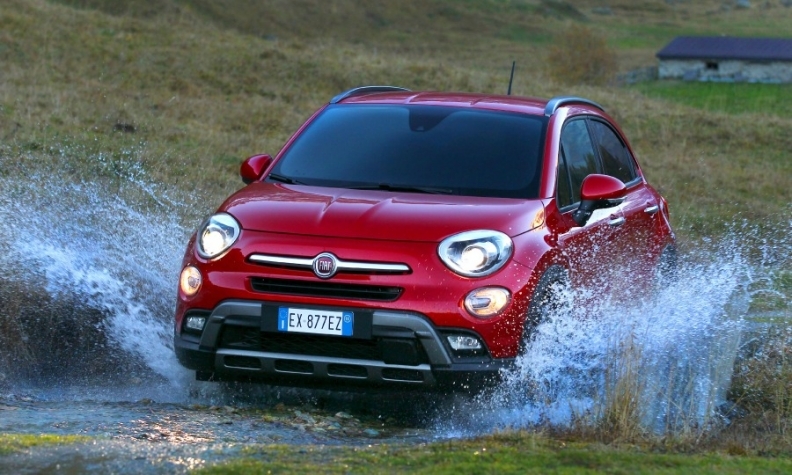 The 500X sits midway between 500L five-seat and 500L Living seven-seat minivans. The 500X is 4248mm long, the 500L is 4150mm and the 500L Living is 4350mm. The gasoline engines have displacements from 1.4 liters to 2.4 liters; the diesels from 1.3 liters to 2.0 liters. Two manuals (5 and 6 speed); 6-speed dual-clutch; 9-speed automatic. The rear axle drive is automatically disconnected to reduce torque absorption when 4wd is not required, reducing fuel consumption. The Jeep Renegade has the same system. The Drive Mood Selector offers three settings that adjust the performance of the engine, transmission, brakes and steering. Drivers can choose what is most suitable to their driving style and the road conditions. The “auto” setting is for comfort and low fuel consumption. “Sport” favors performance and “all weather” is designed for maximum safety during slippery conditions. The 4wd variants have a “traction” setting instead of “all weather.” When engaged, this setting sends more torque to the rear wheels. The crossover and its more rugged-looking sibling, the Jeep Renegade, are built on the first architecture jointly developed by Fiat and Chrysler. The company has an annual capacity of 320,000 for the two models at its plant in Melfi, central Italy. The 500X “represents the beginning of a new growth phase” for Fiat Chrysler, CEO Sergio Marchionne said. Fiat brand global boss Olivier Francois is convinced that the 500X will help the marque grow globally because it combines “Italian style, heritage and technology” in a single package. The 500X will be priced about 2,000 euros less than a similarly equipped Renegade, which commands a price premium because of Jeep’s more upscale image. The 500X is the fifth variant in the 500 family after the hatchback, convertible and the 500L and 500L Living minivans. In Europe, the 500X replaces the Sedici, a sister model to the Suzuki SX-4 built by the Japanese automaker for Fiat from 2005 until 2014.